This commission’s report promises to save the planet by transforming the food and agriculture sector by radically changing our diets. Globally. For everyone, wherever and whoever they may be. Eye roll time. Here we go again. As a livestock farmer I am getting all too accustomed to being told that rearing animals, particularly cows is the reason our climate and environment is in jeopardy. Apparently, cows do more harm to the planet than the oil and energy sector, industry, aviation and transport. Because the sponsors of the report completely believe this narrative, this is the general feel of the paper. Meat bad. Plants good. So, the EAT-lancet report has formulated a diet that has abolished red meat, or at least limited it to 7g per day, eggs to ¼ per day, chicken or fish to 28g per day. Instead it suggests we must eat more vegetables, fruit, legumes, nuts, seeds, plant oils and many more grains. By doing so we’ll save vast tracts or land, nitrogen fertiliser, reduce methane production and save reservoirs full of water. We will be healthier, our rates of mortality will drop by the millions and cancer rates will plummet. Well of course it is. It’s the stuff of pipe dreams and unicorn tears. The vast majority of this report (47 pages) is made up of estimates, assumptions and predictions based on epidemiology studies. In short, they have tested a disease hypothesis in a lab to see how many people fit their predictions, not actual people in real life. When they do cross reference studies that have tested actual living, breathing people in real life scenarios it inconveniently turns out that red meat is rather good for you, but these papers are dismissed, glossed over or barely mentioned. Their reasons? Some of the studies have taken place in parts of the world that are significantly malnourished to start with, and the addition of red meat to those diets has improved health and mortality immeasurably, so they don’t count. Ironically those malnourished people in the studies were consuming a diet similar to the one EAT-Lancet commission has just advised we all embrace…. But I am not a nutritionist, and despite the paper’s dietary recommendations alarming me, I’ll leave the nitty-gritty to the experts. As predicted, every response I have seen so far have been scathing at best and genuinely concerned for human health at worst. Thisarticle is the clearest cut and easiest to digest so far. The section of this report that concerns me the most, (and others like it) is the vilification of the cow. When did this noble beast become the scape goat (cow?) of human failings in creating climate change and the escalation of non-communicable diseases? We are consuming less beef than we ever have but metabolic diseases and environmental degradation is escalating, so why are bovines to blame? I can only assume that the large and obvious nature of a cow are inflammatory to those of a ‘plant-based’ bent. The vegan propaganda films, ‘Cowspiracy’, ‘Earthlings’ etc to name a few have skewed the debate, and the intensification and scaling up of beef farms in the USA have alarmed animal rights activists and environmentalists alike. And they’re right to a certain degree. Putting thousands, if not tens of thousands of cattle in a pen and pumping them full of corn is an abhorrent way to farm. Fed hormones, antibiotics and starchy grain to maximise growth rates and shorten time to killing weight is an environmental and animal welfare car crash. Cutting this sort of red meat out of people’s diets makes total sense. It is no good for anyone or anything. But this isn’t the only way of rearing cows. In fact, despite the numbers in these horrible feedlots, it isn’t the normal way either. In the UK, as is the case in many nations across the globe, the vast majority of cattle are reared on grass, even if they receive supplementary feeding these ‘concentrates’ tend to be waste products of the human food and oil seed industries- the pulp left from making beer, extracting vegetable oil, making plant ‘milks’. Feed that is not edible unless you have a rumen- a sophisticated digestive system evolved perfectly to utilise complex long-chain carbohydrates like cellulose and convert it into high quality, easily digestible protein. Packed full of iron, vitamin B12, omega 3, CLA etc etc. But it is their utilisation of grass that is their true superpower (and that of sheep, deer and goats). Roughly 40% of land use in the UK is grassland or semi-natural grassland. Grassland also makes up an important part of crop rotations, fertility building in-between cereal crops. This use of grass is no accident, in a temperate climate grass grows at altitude, almost irrespective of topography. It tolerates drought and flood, protects and holds onto the soil, sequesters carbon and grows at a huge range of temperatures. The most important part is that it grows from the base of the plant. It has coevolved with grazing animals to be eaten. If recommendations were followed in the EAT-Lancet report and red meat was all but abolished, more land and resources for human food would not be suddenly made available as the report has wildly claimed. Grass grows where cereals, legumes, vegetables, fruit and nuts cannot. Without utilising cattle and sheep to graze these areas and subsequently enter the food chain, we become more nutrient deficient, unable to produce enough complete protein from plants to feed our population. As Sustainable Dish eloquently point out, ‘cattle upcycle nutrients’ taking inedible cellulose and converting it into food we have evolved to eat. But cattle play another role. Their grazing, if managed correctly and holistically and where artificial fertilisers aren’t used, stimulates the plants they eat to regenerate, increasing root mass, growing more leaves and locking up carbon. Their hoof prints break the sward, allowing wildflowers to germinate in the pockets of exposed soil. Their manure completes their nutrient cycle, returning vital minerals and elements to the soil to stimulate plant growth, and attracting insects, and consequently birds and mammals to their pasture to exploit the feeding grounds. 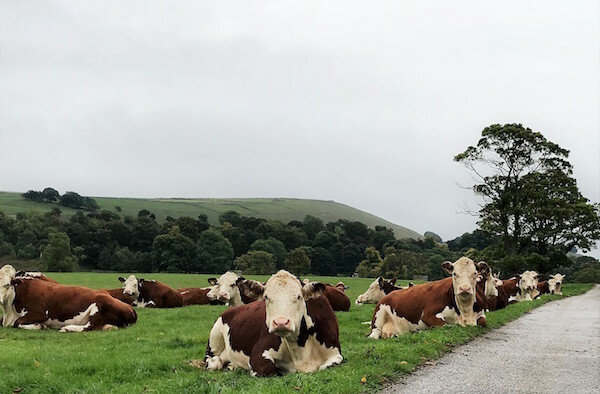 Cows are creators of biodiversity, generators of fertiliser, a fundamental component of the carbon cycle and crucial to the health of pastures and grasslands, marshes and moors, as well as an important way for increasing soil fertility in-between cereal crops. The commission’s report does identify that the production of artificial fertilisers is hugely polluting and energy hungry, and its overuse is causing eutrophication, ozone production, soil degradation and the decrease in plant nutrient carrying capabilities, but does not see that the use of organic farming practices like crop rotation, composting, agroforestry and other agroecological techniques and above all else, LIVESTOCK- particularly cows all have the power to abolish or hugely reduce its use. Unfortunately this does not fit with the ‘plant-based’ utopia they are trying to promote, so instead it recommends more precision farming in the developed world to reduce fertiliser use to allow the developing world to use more…. This is one of the many bizarre suggestions in the report loosely disguised as ‘sustainable intensification’. The promotion of seeds, nuts and vegetables would unfortunately increase both chemical and water use. Thirsty vegetables and salad crops have been responsible for ground water depletion in countries that have the climate to grow them more consistently than the UK can. Almeria in Spain is predominantly under glass and plastic to satiate Europe’s desire for out of season fruit and vegetables. If this demand were to increase as people look to plants to provide protein in place of meat, these alien and chemical laden areas would expand, and the environment, biodiversity and the climate would suffer. The volume of plants that must be consumed to plug the gap left by red meat is frankly frightening and unobtainable. The strangest thing of all is the assumption by the report that cows eat human food. 90% of everything cows eat are inedible for humans. They are NOT stealing our food. In place of beef and lamb people are turning to pork, fish and chicken in particular. These animals seem to elicit less planetary guilt than cows and sheep do. But pig and chickens are monogastrics. They have similar needs to us in terms of dietary input. The grain and soy imported from all over the world for animal feed goes to feed pigs and chickens predominantly. That is a crisis. But chicken gets the green light as a sustainable protein source with a small environmental footprint. Billions of chickens raised every year eating millions of tonnes of human food is seen as sustainable? This madness is echoed throughout the report. I know what many holistic, organic, regenerative, compassionate farmers know: Cows are part of the solution for the future of food, not the problem…. Unless of course you’re in the business of growing, fertilising, distributing and utilising cereal. In which case a global diet that recommends an increased consumption of grains, palm oil, soy and monocrops is good news. Not that I’m a cynical farmer but the Eat-Lancet commission report is bank-rolled by a multi-millionaire vegan animal rights activist who spends her life jetting around the globe to amazing destinations in her own plane and telling the rest of us mere mortals to follow a ‘plant-based diet’ to save the planet. The EAT movement is part of the FReSH network, a group of multinational companies that all have fingers in the ‘sustainable development’ pie and are well placed to exploit the ‘plant-based’ trend. Among its members are Unilever (just launched 700 vegan product lines), Syngenta (seeds, pesticides, ‘big Ag’), Barilla (pasta), Kelloggs (cereals), Danone (processed foods) and PepsiCo (processed food) to name but a few. What we’re witnessing here is a global, industry led push to abolish the ultimate sustainable food source: livestock, in order to push hyper processed, cheap, environmentally damaging, mass produced ‘food’ on the masses in the name of ‘planetary boundaries’ and ‘healthy diets’. Not an analogy they would appreciate, but the vegan movement and propaganda is the front man for control of the food chain by the globe’s largest corporations. The cow is their chosen fall guy but I for one will not stand by quietly while this ludicrous movement gains traction. 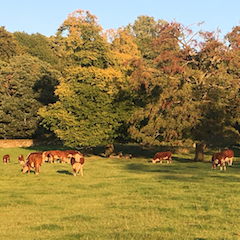 I strongly believe, no – I KNOW that livestock reared ethically and sensitively within their natural habitats are the future of our healthy planet. I shall have my beef and eat it. I suggest you do too. About the author: I’m Meg, an opinionated farmer’s wife, who is passionate about animal welfare, the environment and wholesome food.